Made to order for you within 4 business days. Add a classy touch of curb appeal with your lovely new Vertical Oval House Number Custom Address Plaque. Crafted in the USA from cast aluminum in your choice of four elegant finishes. Quick production time, customizable with up to four digits for your street address number, and ready to mount. The sophisticated oval plaque shape is durable and designed for all weather outdoor use. 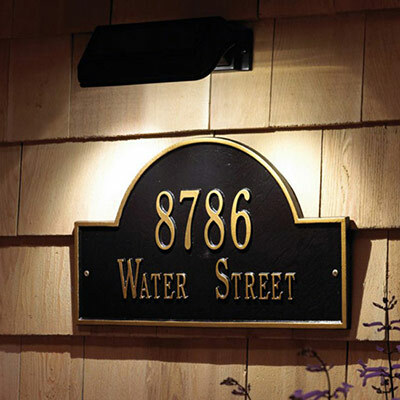 Additionally, you can add a wall mounted solar-powered light to illuminate your new address sign. Solar powered batteries charge all day and automatically turn on the light for up to 14 hours of illumination. Whether it's a pizza delivery or an emergency, make sure that your address can be seen in the dark of night with this durable add-on. Select options above, more details below. See additional product photos. Address plaque dimensions: 3.5" x 19.00" x 0.25"